This is the eBundle Edition of this title: Hardcover + Ebook download code. Whether a Part 121 airline or a Part 135 charter operator, in the aviation industry a company survives by its compliance with the applicable Federal Aviation Regulations, or "FARs." Air Carrier Operations introduces aviation students to the significant FARs affecting airline operations. 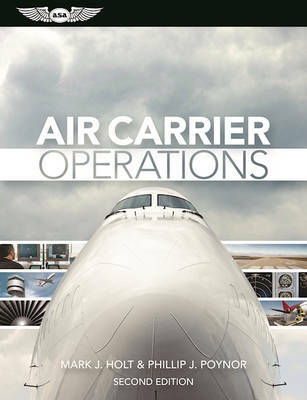 Using this book, both students and professionals will gain an appreciation of the variety of regulatory issues involved in air carrier operations, and can gather the background information they need to identify relevant regulations and apply them to their particular operations or their future employment. The book examines the many rules governing an air carrier and focuses primarily on 14 CFR Part 121 air carriers, although coverage includes Part 119 and relevant portions of 14 CFR Parts 117, 135, 91, and 61. The text emphasizes Instrument Flight Rules (IFR) flight operations, particularly useful to instrument-rated pilots and aircraft Dispatchers. A college textbook, this book is ideal for air carrier flight operations or airline operations courses and it also provides excellent preparation for airline interviews and initial pilot and dispatcher training.